White paper on crime 2001 Part4/Chap.1/3. According to analysis and reviews of the trend of theft among suspects cleared in recent years, snatching and theft from vehicles had a growing tendency to be committed with an accomplice. The percent distribution of shoplifting in the offenses with an accomplice has declined while the percent distribution of theft from unoccupied property and safe cracking has increased overall. The percent distribution of pick-pocketing committed by more than three offenders, i. e. gang pick-pocketing, also increased. As for the profiles of offenders cleared for larceny, the percent distribution of offenders in their 20s to 40s declined or remained stable while the percent distribution of offenders in their 50s and older significantly increased. By looking at the increase/decrease in number of persons cleared for larceny by age group, the percentage per population (the number of offenders cleared per 100,000 persons) has increased from 62.9 in 1992 to 85.9 in 2000 for those in their 50s and from 38.2 in 1990 to 66.4 in 2000 for those over 60. 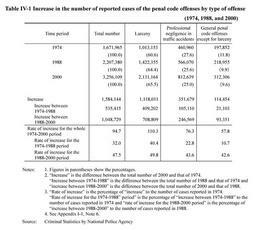 Over the last decade, the percentage of offenders cleared for larceny who had been previously convicted of larceny has increased to 9.5% in 2000 while the percentage of offenders cleared for larceny offenses who have previous convictions/criminal records started to show an increasing trend in 1998 and exceeded the 30% mark in 2000.